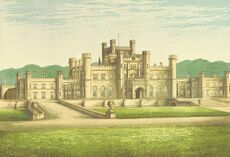 Lowther Castle was the home of Hugh Lowther, 5th Earl of Lonsdale, the initial driving force behind the formation of the Lonsdale Battalion; a unit in his own name funded with his own money. He brought the battalion together by appointing officers and ordering the weapons and munitions needed to arm his men, all at personal expense. Text from A Series of Picturesque Views of Seats of Noblemen and Gentlemen of Great Britain and Ireland by Francis Orpen Morris. The castle of Lowther, which gives its name to the family of Lowther, derives its own from the river Lowther, or Louder, by which it is watered. Lowther Hall of the older date was pulled down in the year 1685, and rebuilt by John, first Viscount Lowther. It was burnt to the ground in 1720, that is to say, the two wings excepted. It was built again in 1808, the necessary materials of stone and timber having been collected for the purpose previously by the first Earl Lowther. The north front, which is surmounted by eight lofty turrets, is four hundred and twenty feet long. In the centre of it is a noble open porch large enough for the entrance of carriages. The south front is two hundred and eighty feet long, the grand saloon being in the middle, and other magnificent apartments on either side of it. The view to the north embraces the Beacon Hill, near Penrith, Saddleback, which rises three thousand and forty-eight feet above the level of the sea, and the mountains of Scotland in the distance. The great terrace is nearly a mile in length, and overlooks a portion of the park with its forest trees of large growth and scattered herds of antlered deer. 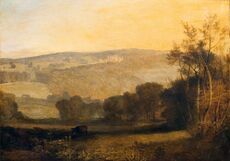 The family of Lord Lonsdale descends more immediately from Sir Richard Lowther, living in the reign of Elizabeth, but its more remote ancestry is lost in the mists of antiquity, its "local habitation" being unquestionably that above indicated. Lowther Castle and gardens on the Lowther Estate website. Lowther Castle and Gardens on the Lowther Castle website. Lowther Photography Project by Anthony Rumsey. ↑ Rev. Francis Orpen Morris (1870). A Series of Picturesque Views of Seats of Noblemen and Gentlemen of Great Britain and Ireland Vol.II London. This page was last edited on 17 November 2017, at 20:13.